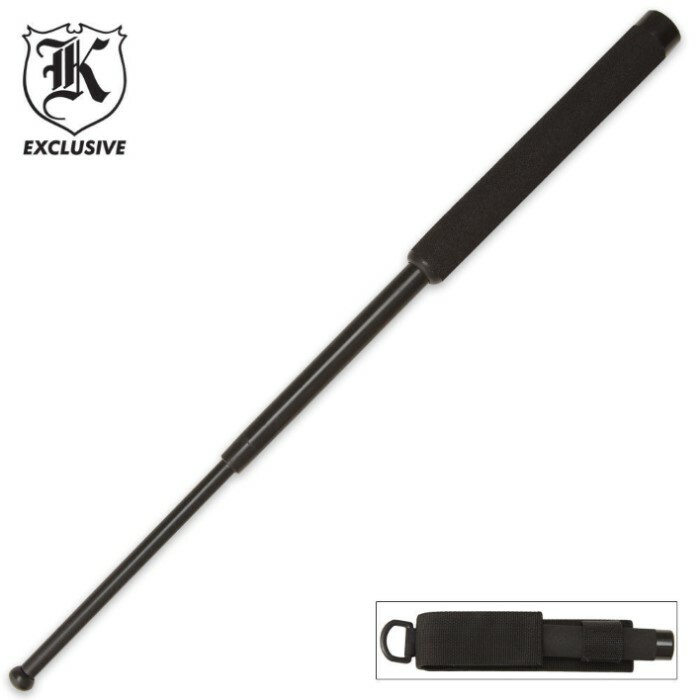 Defend yourself with this baton - used by police around the world! Expands to 26" long. I bought this along with another 26'' baton to compare quality. Along with the testing I've done, right it of the box it's very confidence inspiring. The lock works great but it opens with at least a bit more than a flick of the wrist. Needs some love to get it closed but there is a solid chance there will be ground available where ever you use it so no sweat. And dude makes a good point in the other comment, you might want to use this for thrusting anyway. You can't beat the price for the quality. Buy this, you will like it a lot. Wanted something discreet to keep in my company van and this was exactly what I had hoped for. Locks up solid and has some weight to it. Would be a formidable weapon against an attacker. Will be buying more. Got this baton a couple days ago, and I've been putting it through some tests. Smashed clean through a 2x4 without even scraping the paint. A casual flick of the wrist won't lock it open, but it doesn't take too much more than that. Locks into place nicely, very solid. Tough to retract, but that's not a bad thing, as it allows the thrusting techniques I'm so fond of. Balance point is perfect, good weight, and an excellent price point. All in all, I think this baton and me are going to be good friends for a very long time.